From 1 July 2016, new proposed regulations will make landlords responsible for ensuring operational smoke alarms and detectors are installed in their rental properties, and tenants will be responsible for replacing batteries or notifying landlords of defects. You should also be aware that The Ministry of Business, Innovation and Employment will have the power to investigate and prosecute any landlords found breaking tenancy laws as part of these aforementioned reforms. Such prosecution will be taken very seriously when there is a risk to the health and safety of tenants. The new alarm standards require a minimum of one working smoke detector in a hallway or similar area, within 3m of each bedroom door. The NZ Fire Service also recommends that they’re also installed within the bedrooms themselves. a) There must be at a minimum one working smoke detector in each bedroom in the hall or similar, within at least three metres of the bedroom door. In a caravan, self-contained sleep out, or a similar vehicle, there must be at least one working unit. b) It is the landlord’s responsibility to make sure the alarm is operational when each new tenancy begins, but it is the tenant’s responsibility to replace batteries when needed during their tenancy. They must also report any defective alarms in their rental property to their landlord. c) Long life (10 year) photoelectric alarms must be installed when there is no existing alarms. d) If there are existing alarms, these must be replaced by long life photoelectric alarms when the existing alarm expires. (This date is usually found on the back of the alarm.) Hardwired alarms are also acceptable. Installing smoke detectors protects lives and protects your asset – it is one of the first lines of defence when it comes to fire safety. 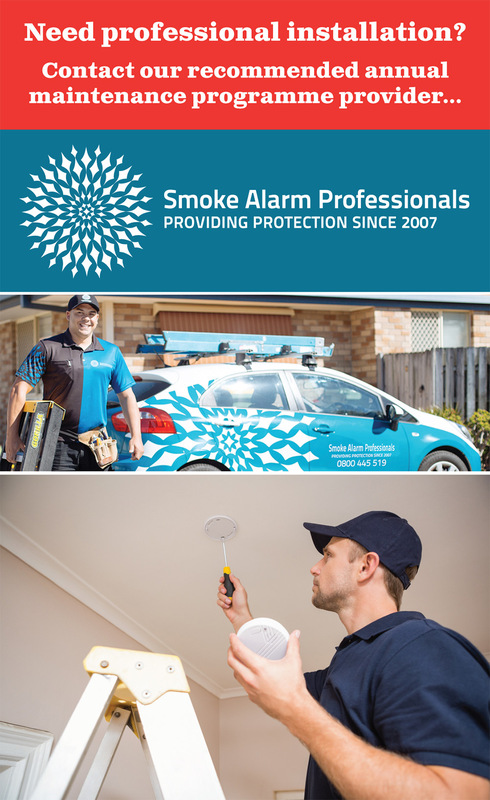 Long–life photoelectric smoke detectors are generally recommended by the Fire Service and should be installed in every living area, bedroom, and hallway in the property, whether rental or otherwise. As an experienced fire safety product distributor we can offer quality certified photoelectric long-life alarms to you at prices well under typical retail price levels – click on the Shop Now link now – we’d love to hear from you.